For over two years, some fifty people from all social groups from all over the province of Liège have been taking part in the Groupe de Réflexion Liège 2020 (Liège Think Tank 2020). This group was formed on the basis of an initiative by the SPI+ and has benefited from scientific advice from the foresighting association Futuribles. The members of this group have accomplished this work as individuals refusing, unlike others, to accept fate based on the assumption that the future follows its own course and is simply imposed by external circumstances. It is the “result” of their work that we are presenting to you. “Result”? Not exactly a complete one since this work represents only a beginning. It aims to rouse among all the inhabitants of the province a collective awareness of what is at stake in what we risk being confronted with in the short, medium and long terms. It’s a work which combines anticipation and action: to identify what is at stake in the future, it has proved indispensable to form a diagnosis of the strengths and weaknesses of our current socio-economic environment that is as objective as possible without being alarmist and without complaint, avoiding self-recrimination but without averting our eyes from the reality that we are living either. The formulation of the scenarios (4 in fact) that flowed from this is a complex exercise that needs to be well understood. It is not a matter of predicting how tomorrow will be (the foresight is not futurology…) by means of a few scenarios one should choose from! The process is absolutely not of that nature. The scenarios, which are by way of examples and explorations, have the aim of illustrating the range of possible futures. 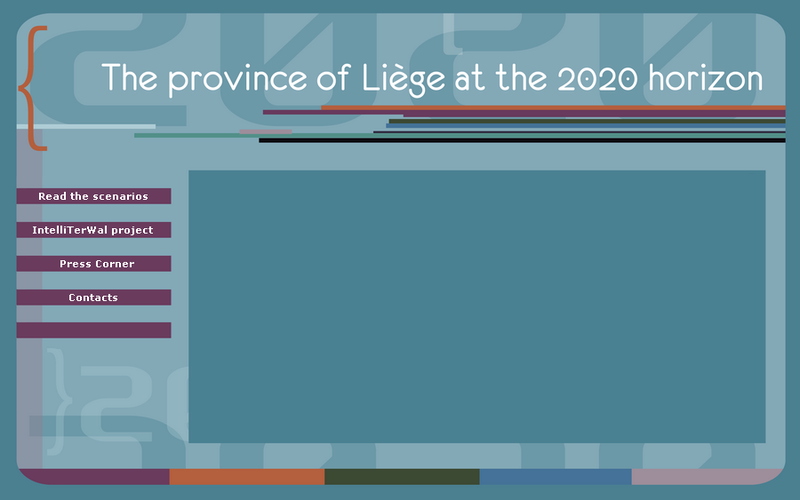 These “possible futures” for the province of Liège allow us to isolate a certain number of crucial areas of risk for the province regarding which it will be vital to rapidly adopt coherent and appropriate attitudes and policies. It will be necessary in time to develop a shared vision of a desirable future based on the province’s many advantages, by formulating clear objectives and by creating a strong consensus on the way of achieving them. “Who must do what, when and how?” These are the areas that we want to submit to public debate. It is therefore obvious that this study is neither definitive nor complete in itself. It aims to encourage reflection and above all to provoke action. With this double aim, it must be able to bring a tangible input to our thinking and to the projects currently in the pipeline in the province of Liège. And to do all this in a positive spirit of indispensable cohesion and cooperation.